Recently, our family took a wonderful vacation to Orlando, Florida. After booking our flight, the first thing I did was book our hotel. My kids had seen many commercials for Nickelodeon Suites Resort and they were really excited at the thought of staying there. We booked our stay and were guests of the hotel for part of our visit to Orlando. We couldn’t have picked better accommodations for our family. The hotel is made up of suites, which was especially nice when traveling with a large family. The room fit our needs perfectly as it had a small kitchenette, two bedrooms, a pull out couch in the living area, and full bathroom. The room was immaculate. A cool feature in one of the bedrooms is that is created just for kids. Spongebob murals on the walls and built in bunk beds made for a very fun retreat. Our room had three TV’s for the kids to enjoy Spongebob while we settled in for the night, but honestly, they didn’t spend much time watching TV, as they were completely exhausted from all of the events and activities that took place at the resort and crashed right away. Nickelodeon Suites Resort is a not just a hotel. It is a destination in and of itself. Loaded with family friendly activites, my kids didn’t want to leave, and really there is no reason to have to. Even in December, the weather was gorgeous and the kids were able to lounge in the Lagoon Pool and play in the incredible Lagoon Slide Tower. This is an area loaded with slides, water fountains, flumes, water jets, and climbing nets, as well as a bucket that holds 400 gallons of water (and sometimes slime!) and they kids had a blast here. Every day at a certain time, you can be slimed with green ooze (that washes away easily) that the television network is famous for. As if that weren’t enough, mini golf, basketball, whirlpools, and activity stations are set up in the lagoon pool, as well. We would let the kids go explore this awesome playland and my husband and I kicked back on the lounge chairs, enjoying some special smoothie concoction from the Lagoon Grill & Bar. It was heavenly! Poolside entertainment is often present, too, and my kids got to meet the Teenage Mutant Ninja Turtles, as well as see try outs for the nightly Double Dare show held on property. As a guest of the resort, you get to attend and sometimes participate in Double Dare, which I highly recommend. We made it to the theatre and all four of my kids got to participate in a new version of that favorite family game show that we all watched as kids. This was really fun and I loved seeing my kids on stage doing dares and having a blast. They got to see what the physical challenges and obstacle courses were like and it was so cool. For breakfast at the resort, you have the opportunity to sign up for a special character breakfast. We got to experience a very delicious breakfast with the company of Ming Ming (The Wonder Pets, one of my son’s favorites when he was in preschool), Spongebob, Patrick, Blue, and Dora. We took some great photos and made some memories my kids won’t soon forget. The resort is very clean, well run, and the crowds are limited, as only guests can use the facilities. Which, after visiting so many theme parks in the area, was a definite plus to not have to fight any crowds. My family had an incredible time at Nickelodeon Suites Resort and I would highly recommend staying when you go to Orlando. The location is very close to the theme parks. My only complaint about the hotel is that we didn’t stay there our entire trip, as we spent our time in two hotels. We will definitely come back to get slimed again! 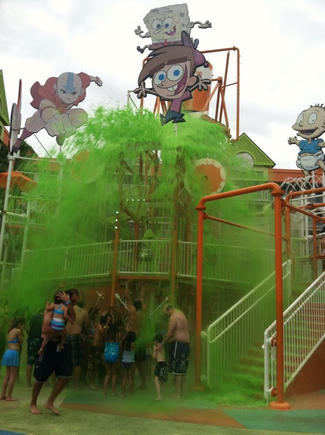 You can learn more about Nickelodeon Suites Resort by visiting their site online.